[125 Pages Report] The aircraft propeller system market is estimated to be USD 246.6 Million in 2017 and is projected to reach USD 329.9 Million by 2022, at a CAGR of 5.99% during the forecast period from 2017 to 2022. The base year that has been considered for this study on the aircraft propeller system market is 2016 and the forecast period is from 2017 to 2022. 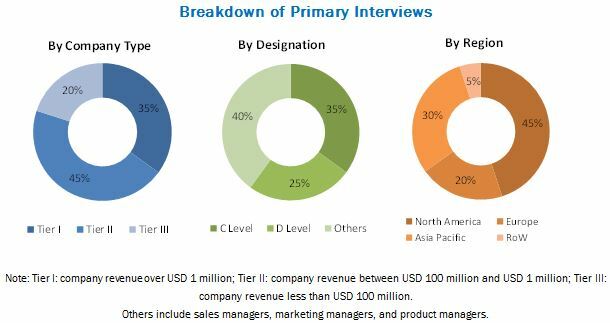 The ecosystem of the aircraft propeller system market comprises manufacturers, component and system suppliers, aftermarket operators, and technology support providers. Hartzell Propeller (US), MT-Propeller (Germany), Dowty Propellers (UK), McCauley Propeller Systems (US), Airmaster Propellers (New Zealand), FP Propeller S.r.l. (Italy), and Ratier-Figeac (France) are some of the established players in the aircraft propeller system market. These leading players offer systems, products, and services based on advanced technologies. They also provide a broad range of engineering, technical, aftermarket, refurbishment, and information services for aircraft propeller systems. The aircraft propeller system market is estimated to be USD 246.6 Million in 2017 and is projected to reach USD 329.9 Million by 2022, at a CAGR of 5.99% during the forecast period from 2017 to 2022. Growing demand for lightweight and fuel-efficient aircraft and increasing number of deliveries of Special Light-Sport Aircraft (SLSA) are expected to drive the growth of the aircraft propeller system market across the globe during the forecast period. The aircraft propeller system market across the globe is expected to grow at a significant pace during the forecast period due to increasing demand for lightweight and fuel-efficient aircraft from the Middle East, Asia Pacific, and Africa. Moreover, increasing application of unmanned aerial vehicles in the military sector for critical defense missions and rescue operations is further expected to drive the growth of the aircraft propeller system market in emerging economies. However, high costs involved in the manufacturing of aircraft propeller systems and increased maintenance costs of turboprop engine aircraft act as challenges for the growth of the aircraft propeller system market. The demand for different types of civil & commercial aircraft is estimated to grow at a significant rate during the forecast period. Different types of utility aircraft are used to transport passengers and cargoes from one place to another cost-effectively. These aircraft are equipped with the modern and advanced propeller systems resulting in short take-off distance required by them, along with improved cruising speed and control. Moreover, propeller-based aircraft offer excellent lifting capabilities and are highly fuel-efficient. The blades component segment is estimated to account for the largest share of the aircraft propeller system market in 2017. The growth of this segment of the market can be attributed to increased use of composites to manufacture propeller blades. The hubs component segment of the aircraft propeller system is projected to grow at the highest CAGR during the forecast period. The North American region is estimated to be the largest market for aircraft propeller systems in 2017. 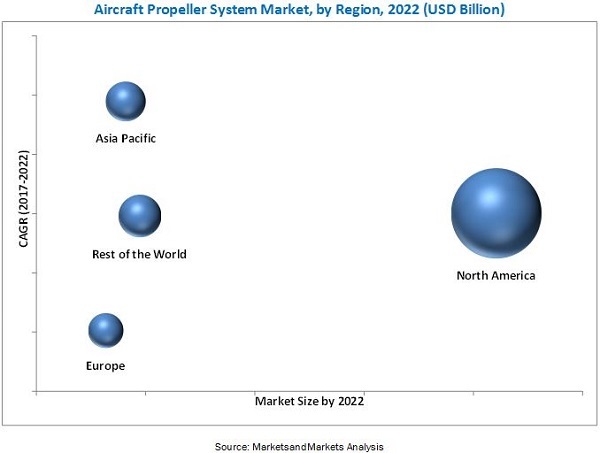 The aircraft propeller system market is expected to witness considerable growth in the Asia Pacific region during the forecast period due to the increasing demand for fuel-efficient turboprop engine aircraft. Moreover, the increasing demand for varying pitch propeller-based aircraft from emerging economies is also expected to fuel the growth of the Asia Pacific aircraft propeller system market during the forecast period. Countries such as China, Brazil, and India have huge growth potential for the aircraft propeller system market as governments of these countries have increased their defense spending to enhance their civil & commercial and military aircraft fleet. Hartzell Propeller (US), MT-Propeller (Germany), Dowty Propellers (UK), McCauley Propeller Systems (US), FP Propeller S.r.l. (Italy), and Ratier-Figeac (France) are some of the established players in the aircraft propeller system market. These leading players not only offer different products and services to cater to the requirements of their customers but also provide a broad range of aftermarket, engineering, refurbishment, technical, and information services.